The Chinese crested were believed to have evolved from hairless African dogs while on board with Chinese mariners. These dogs were used to remove the vermin that lived on ships in times of sickness. The breed was shown often in European arts and the architecture within the 19th century. Shows for the breed began to arise in the later 1800's and were recognized by the AKC by 1991. 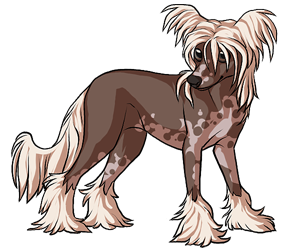 The Chinese Crested comes in two different variations of fur style- Hairless and powder puff. The hairless effect comes from the dog having a incomplete dominate trait gene.